Rowanthorn began on Oswestry market in 2007 with Mike Coppock selling pasminas, incense and lovely things from Northern India and Nepal. 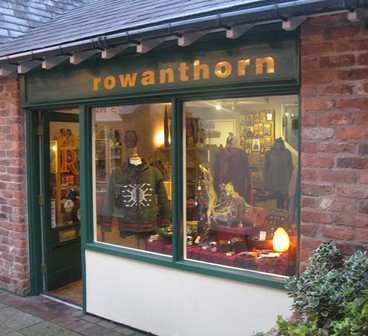 Mike openned the first Rowanthorn shop on Beatrice Street in 2011, and after 18 months moved to the current location in the attractive Old Chapel Court in the heart of the town. Rowanthorn is a happy, friendly, relaxed and colourful shop which appeals to all ages - selling ethnic clothing, scarves, bags, purses, incense, jewellery, wind chimes, dream catchers, Himalayan salt lamps, rugs, cushions, throws, Buddhas, jergas, singing bowls, Afghan slipper socks, and lots of other interesting and fun things! Always innovative, sourcing new and interesting gifts with a preference for ethically produced and fair trade products. Located in Old Chapel Court, off English Walls, in the beautiful and friendly Shropshire town of Oswestry. Rowanthorn has a fair-trade ethic, and tries to stock affordable fairly traded items where possible. 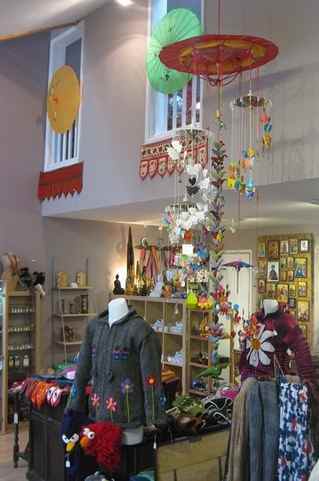 Browse the shop for a large choice of scarves, slipper socks from Afghanistan, Buddhas, didgeridoos, 'grandad' shirts from Nepal; jumpers from Equador, jergas (hergas) from Mexico, kurtas, tops, skirts, dresses, jewellery, bags and purses, and religious icons from Greece. We also stock a large selection of incense sticks, cones, and raw frankincense resins. A unique and colourful emporium. Rowanthorn also offers a free service as a Ticket Office for local events in and around Oswestry. This is a community service, providing a central location in the town for selling tickets for any sort of ticketed event. If you are a local event promoter, contact us about selling your tickets for you.